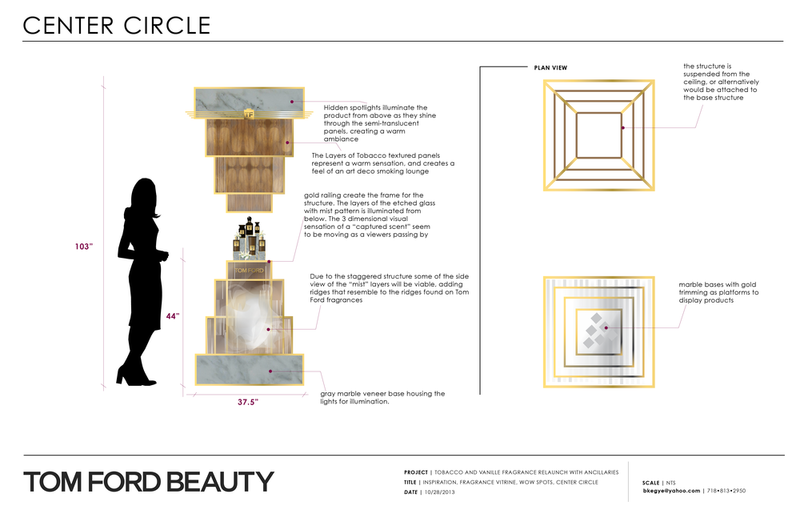 In this project I wanted to see how the brand codes of Tom Ford could interplay with point of sale displays for a fragrance relaunch. I took inspiration form the signature packaging of the brand, but was focused on coming up with a visual display that plays with the fragrance ingredients and provides an olfactory experience - but visually. The display was to evoke curiosity to explore the scent while alluding to the various notes encapsulated in its essence. I wanted to capture the essence of a scent and lock it in, with all its freshness. Sort of like a 3 dimensional photo capture of a precious but brief moment. My proposal: to layer glass sheets that are sand blasted or painted with a soft mist pattern. When the layers are positioned in front of each other they form a unique three-dimensional cloud captured for eternity - symbolizing the illusive essence of the Vanilla fragrance. To capture the scent of tobacco - the other note in the fragrance - I proposed using a layering technique that combines rich gold reflective sheets with dried tobacco leafs. The cracks and imperfections of the natural leaf would let the light shine through it and the display would resemble a luxurious tobacco factory where leafs are left out to hang-dry. The air is filled with their masculine, aromatic fragrance. I created a bespoke tester /display unit that would fit is well with the existing brand presentation. I wanted to make sure I put the perfume at the front and center, luring in clients and making testing and selling easy and uncomplicated.